Fine wine prices have dropped dramatically since the summer, meaning 2012 could be a buyer’s market for top Bordeaux. 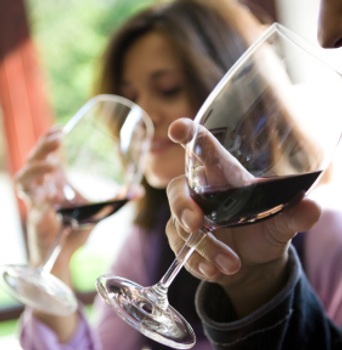 Although the first six months of last year saw fine wine prices rise rapidly, a sharp decline from July onwards has shown 2011 to be a year of two halves. 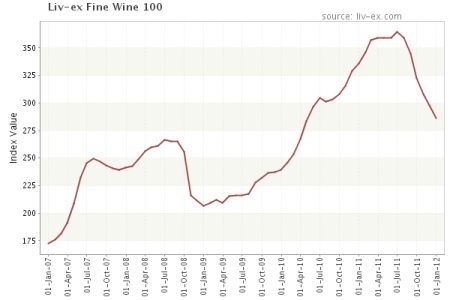 Prices peaked on 28 June, when Liv-ex recorded an 11% increase for its Fine Wine 100 index, which represents the price movement of 100 of the most sought-after fine wines on the secondary market. However, the last six months to the end of December witnessed a sustained decline in demand, with the index dropping 21%, and fine wine prices for 2011 falling by 15% overall. Reporting on the market at the end of last year, wine merchant Bordeaux Index blamed the price drops on a falling interest from investors, rather than consumers of fine wine. Hence, the declines have been greatest in those labels – primarily Bordeaux’s first growths – which have attracted the most speculative demand. “It is clear that the highly speculated brands and vintages are experiencing the sharpest pull-back,” noted the merchant. However, the latter half of last year has highlighted a greater interest in Bordeaux’s lesser, and cheaper classed growths, in particular the region’s so-called “super seconds” and “flying fifths”. Indeed, Liv-ex picks out Léoville-Las Cases and Cos d’Estournel as two deuxièmes crus which have outperformed the market. Outside Bordeaux, it is, of course, Burgundy’s leading wine, Romanée-Conti, which has continued to defy downward market trends. Nevertheless, in terms of the first growths, Liv-ex, writing in the January edition of the drinks business, noted that older vintages of Bordeaux’s top tier, excluding Lafite, are moving into a “buy zone”. Having surveyed its trading members, Liv-ex said that the £250-300 per bottle price range was a point at which UK-based fine wine enthusiasts would buy first growths once more, as opposed to pure investors or global high net worth individuals, comparing this sum to the cost of a night in a mid-range London hotel. As Liv-ex explains, “If we take the 55 first growths from vintages 1995-2006 (excluding 1997) we find that in June 2011 only three of these wines had a price of below £300 per bottle in-bond. “By the end of November this group had grown to 24,” it added. Bearing in mind this, and the fact that many of these wines are coming into their drinking windows, consumption should rise and supply fall, potentially halting further price drops. For these reasons, Liv-ex concludes that now might be a low point in the market and a good time to buy. Finally, it should be added that now is traditionally a time of re-stocking among Asian fine wine consumers in time for Chinese New Year, which occurs on 23rd January, in 18 days time. For more analysis on the fine wine market see January’s edition of the drinks business, which will be mailed out later this week.